Take a guided journey and Bagan tours from Yangon back in time to discover over 2000 pagodas, temples of the former capital Bagan. In history, there were over ten thousands of monuments built on an area of 100 sq km that presented the prosperity of Bagan. But most of the architecture works were destroyed by climate change over time. Today, we are still overwhelmed by its ruins remain after a heroic history. As one of the richest archaeological sites in the world, Bagan is more than a historic destination. The travelers can enjoy the mesmerizing panorama of Bagan atop thousands of temples, get lost in the hustling and bustling Nyaung U Market or visit a local lacquer ware factory to see how the locals earn their living with their traditional handicraft. Especially, passengers can discover a spectacular Bagan from bird-eye view by air balloon which is considered as one of the most memorable experiences when taking Bagan tours from Yangon. 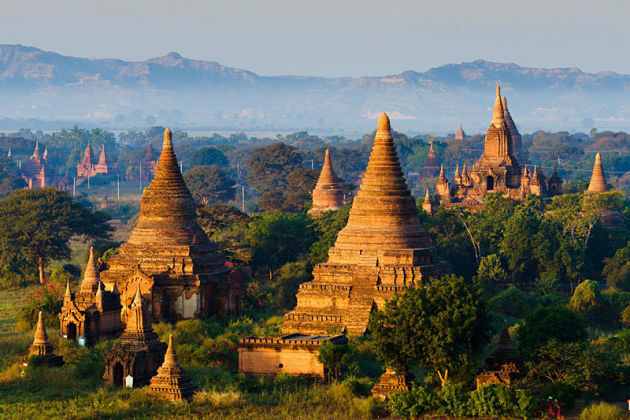 Asia Shore Excursions has tailor-made many options for Bagan shore excursions. Have a look at our recommended Bagan tours from Yangon. These Bagan itineraries will expose an untouched land that offers you a unique opportunity to travel back in time – an escape from the modern world! Located in the Mandalay Region of Myanmar, Bagan is an ancient city which was the capital of the Pagan Kingdom – the first one unified the regions that would later constitute modern Myanmar. Because of its long-term history, the Bagan Archaeological Zone is the main attraction of the country’s nascent tourism industry. Besides, the Bagan plains alone has over 2,200 Buddhist temples and pagodas still remain from the 11th, 13th centuries to the present day and many more attractions are waiting for you to explore in your Bagan shore excursions. Because Bagan is not near a port for the cruise ship to berth, the ideal option for tourists is to go the Yangon tours – a day trip around the capital city of Myanmar, also a worth place to come and visit Bagan later – very convenient! By the way, a wide range of top things to do and see in Bagan are listed as the suggestions for tourists to try them all in their Bagan day tours! During the kingdom’s height between the 11th and 13th centuries, Bagan used to have over 10,000 Buddhist temples, pagodas, and monasteries which still remains over 2,200 to the present day as mention above. 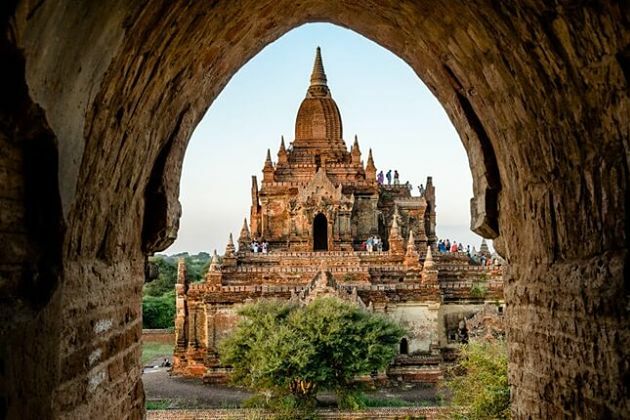 Therefore, these ancient religious temples and pagodas are definitely the significant feature of Bagan and should be the very first destination for visitors to explore in their Bagan shore excursions. However, it is very difficult for tourists to visit all those 2,200 temples and pagodas while their Bagan shore excursions cannot last long. Khay Min Ga Temple, Ananda Temple, Sulamani Guphaya Temple, Htilominlo Temple, Manuha Temple, Shwezigon Pagoda are some highly-suggested spots for tourists to save their time. If that suggested list is still too long for your short Bagan day tours, Ananda Temple, Sulamani Temple, and Shwezigon Pagoda are three must-visit buildings that should be put on the top of your list. 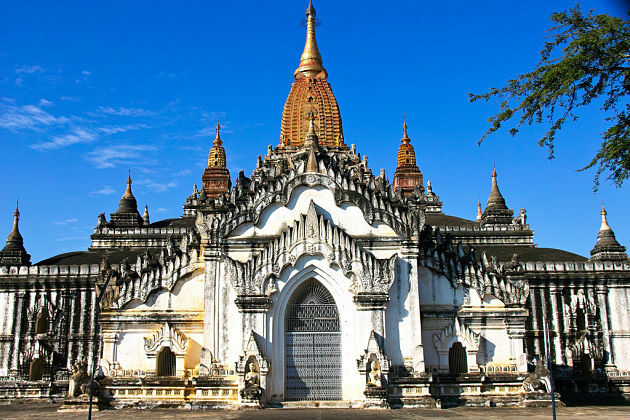 Being one of the first great temples to be built in Bagan and is well preserved, Ananda Temple is one of the most well-known and beautiful temples. Built towards the end of the early Bagan period, the Ananda temple’s architecture style shows Mon and North Indian influence. Thanks to that influence, the Ananda is an elegant, symmetrical structure with the layout of a Greek cross. You will be amazed by various Buddha images in different poses different positions, or an umbrella-shaped spire ornament on top of a hti, small golden sikhara and so on. The name of the Sulamani Temple has a very lovely meaning – the small ruby. Being built from the late Bagan period, the Sulamani is a large and elegant multi-storey structure. All four sides of the temple have entrance porches so that you can go whatever porches you would like to. It will be such an interesting adventure for tourists to explore Buddha imagines on each of its four sides right at the moment they enter the porches. Moreover, while you walk along the corridor, various frescoes and murals from different eras in the lower cube will tell you the story about the life of the Buddha and a variety of mythological animals which absolutely broaden your knowledge. Being one of the oldest and most impressive monuments of Bagan, the Shwezigon Pagoda is most gorgeous when it glimmers under the sun. 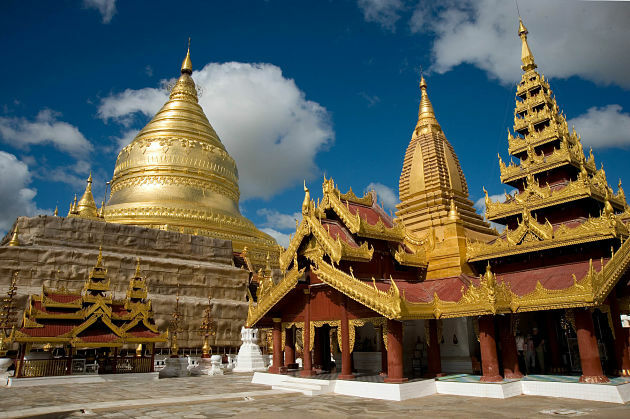 You cannot open your eyes widely to witness this huge gold-plated pagoda in daylight. After dark, the pagoda becomes really mystery while it is illuminated by spotlights which will certainly amaze you. One more reason for tourists not to miss this pagoda is because of the Shwezigon festival. Being held during the 9th month of the Burmese calendar, the festival will attract thousands of devotees – a wonderful opportunity for tourists to have an authentic experience on Buddhism in this religious country where is worth visit on their Bagan day tours. Whatever countries you go, you should always visit their local markets to experience the most authentic daily life of local people. No reasons to make your Bagan shore excursions an exception. Being a local market in the village of Nyaung U to the Northeast of Bagan, the Nyaung U market is definitely the must-go one that will amaze tourists. This market will provide such a great opportunity for tourists to admire how people here conduct their daily lives and take photos of colorful products and local Myanmar people as well. A wide range of tourists visit this country every year makes the local people here totally get used to with foreigners, therefore, you can have the most authentic photos ever. It is very easy for tourists to find the items you want to because different sections in the market sell different items from rattan items, tea leaves- a delicacy in Myanmar to Myanmar traditional clothes- longyi- everything you are looking for is in here. Moreover, the Nyaung market also includes a wet market is waiting for tourists to explore. While you have a walk throughout the city, a various incredible collection of lacquerware will make you take to it at the first sight. Do you want to know how the local people make these marvelous products? Do you want to experience making it yourself and have a unique one of your own? 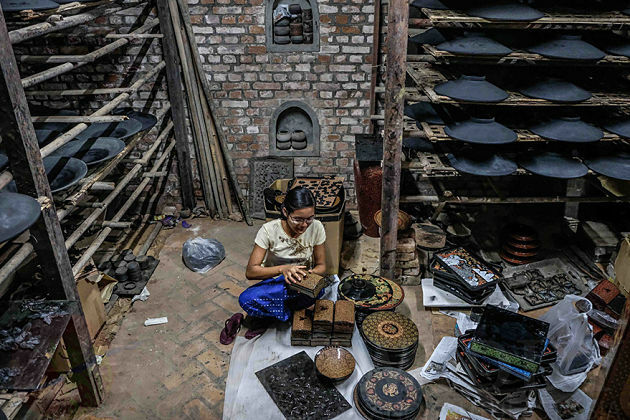 If so, the Bagan House Artistic Lacquerware factory will make your dream come true! You will have the opportunity to observe artisans making a nice collection of good quality lacquerware step by step – their speed will surprise you. Afterward, you can study from the best, the local experts will slowly guide you how to make a simple lacquerware. Next, it is the time for visitors to enjoy their own creative experience and take home your truly unique souvenir that no one else can have the same one. 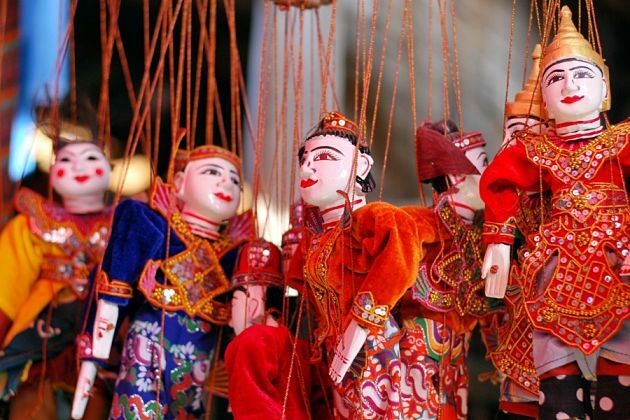 Learn a new skill from the local experts and have your own souvenir – what a great deal that foreigners should not miss on their Bagan shore excursions. 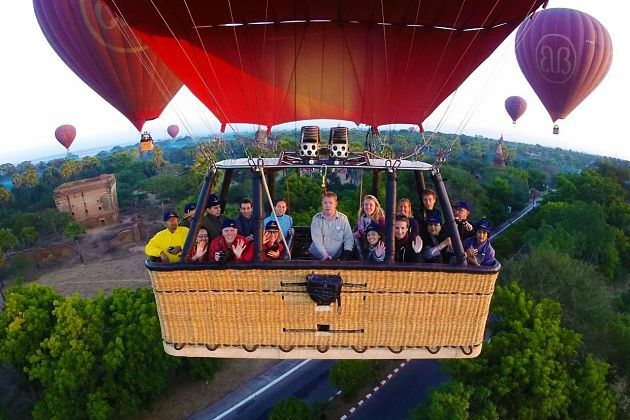 Slowly fly up to the sky, do not need to do anything besides indulging yourself in the flow of the wind – how wonderful experience that you should try it right away – the hot-air balloon over Bagan shore excursion. It is highly suggested that you should experience it in the daylight that will offer you the opportunity to enjoy the gorgeous sunrise and save your times too. Because a thorough safety briefing will take you about 45 minutes to 1 hour before balloon flight starts. In that time, you can enjoy your light breakfast and witness the way workers inflate the balloons. It is normally last between 2h30 to 3h for the whole balloon flight, afterward, you still have times for a city tour. Otherwise, if your flight in the afternoon, it is also available but it is likely to be canceled due to the weather conditions and you will have less time for other destinations. Therefore, tourists are offered to have a sunrise flight in their Bagan shore excursions, of course, tourists can tailor-make their own tours depending on their interest.